For people wanting to lose weight, the equipment needed is minimal. Many think that pumping iron and using all of the equipment available in the gym is going to make them lose weight. This is somewhat correct as strength training boosts your metabolism, however, it is not the fastest or most effective way for weight loss. 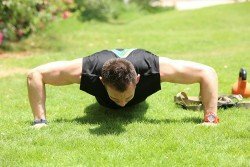 As a personal trainer in Abu Dhabi I want to share some tips with you about exercise ‘without’ the need for multiple pieces of exercise equipment. In fact, the most effective way to lose weight is to perform short bouts of intense exercise and believe or not, equipment is NOT necessary! The goal is to elevate one’s heart rate to 70-90% of their max heart rate as well as performing full body movements. Hitting the desired heart rate goal means that your body is reacting to the exercise, creating an ‘afterburn’ effect, where the body burns significantly more calories than it would performing regular weight training exercises. Not only does it keep the heart rate up but it also boosts muscle and strength development. Working out without equipment can be considered a much more efficient way to exercise. Some people can be intimidated by a gym environment, especially ‘newcomers’, thus working out in one’s own home will enable them to feel relaxed and comfortable, meaning they will physically benefit much more. A lot of people that are new to the gym or exercise continue to work out without really knowing what they are doing (this is where a personal trainer in the UAE can really help) This will not help them achieve the results they want and will be less motivated to continue a regular exercise program. People are enticed to use the resistance equipment as this seems the easiest option, however, they are less likely to benefit from this as their form and technique could be drastically wrong. This could further lead to ineffective workouts and serious injuries. Gym workouts can often get monotonous and tedious, resulting in the gym-goer quitting as quickly as they started. In contrast, a bodyweight workout has a vast variety of exercises which can subsequently reduces boredom and break any sort of mental or physical plateau that you may be experiencing. Having a personal mobile personal trainer in Abu Dhabi or Dubai that can come to your home or meet you in your local gym can be the answer to these problems! Finally, body weight exercises are so appealing because they are accessible for all; whatever age, shape or size you are, everyone can participate! Performing exercises without equipment is arguably the most effective way to lose weight, and it can also help build muscle, strength and increase definition. If you’re looking for this particular goal, learn from a qualified fitness professional about how to workout from the comfort of your own home! The number one reason people workout is to see results and since the majority of body weight exercises involves compound (full body) movements, it is likely to see quick and visible gains. If you would like to change your lifestyle for the better and learn more about implementing a specific, EFFECTIVE program without the use of equipment, which is still fun and enjoyable then do it, meet with a reputable licensed, insured personal trainer in the UAE and start making changes today.